Featherweight Champion Frank Buenafuente Defends His Title Against Julio Arce At | Lou Neglia's Ring of Combat | Next Generation of Mixed Martial Arts! “Buenafuente against Arce is right up there with Weidman vs Hall and Wade vs Perez,” said Lou Neglia. “I truly feel that you either win or you learn in tough fights and just like many of their ROC alumni before them, I have no doubt that after this fight, both Buenafuente and Arce will get the UFC call,” he continued. New Jersey native, Buenafuente, is coming off an impressive win at ROC 56 against the highly touted Nekruz Mirkhojaev (2-1). 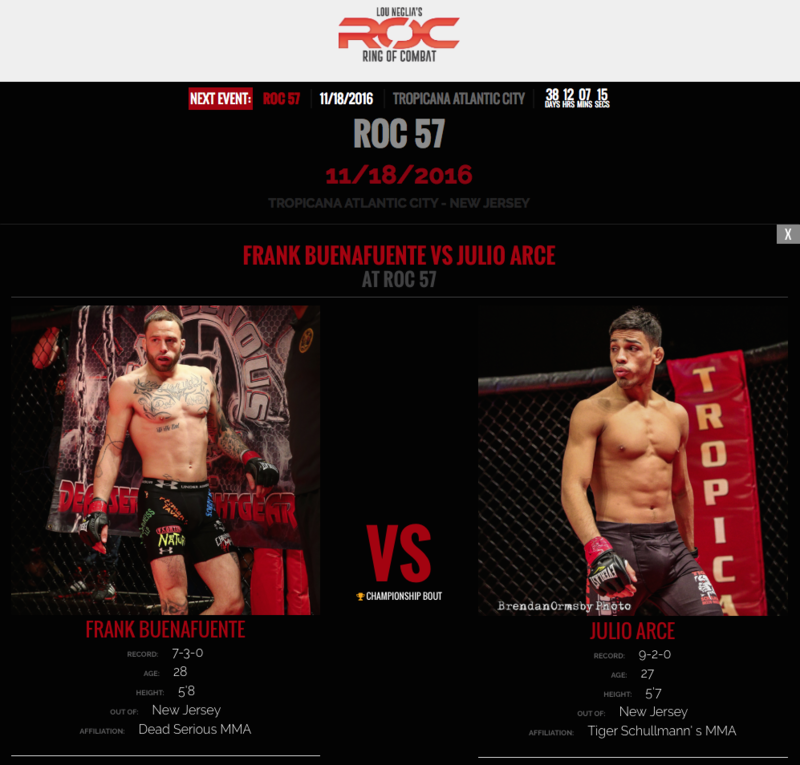 With that win, Buenafuente is on a five fight win streak and is looking to defend his title for the second time at ROC 57. Julio Arce has been with the ROC banner since the beginning of his pro career with one fight taking place outside of the promotion. Quickly becoming one of the faces of ROC, he won the bantamweight title in his fifth pro fight and successfully defended the belt three times. He now has his sights set on more ROC gold in a new weight class when he takes on Buenafuente in November in a must see fight! “These are the kind of fights that fans and myself get excited for, when it’s the best taking on the best and it’s such a great way to end 2016 for Ring of Combat,” said Lou Neglia. “A week before we get the historic UFC card in the most famous arena in the world, Madison Square Garden, which features many ROC alumni including Eddie Alvarez, Chris Weidman, Frankie Edgar, Jim Miller, Lyman Good and a week later we’re bringing Bueanafuente vs Arce. It’s a good time to be a fight fan,” he continued. Also on ROC 57 will be current lightweight champion, Bradely Desir (9-5) who takes on Shokhin Safarov (3-2). More highly competitive bouts will be announced in the coming days. Ring of Combat 57 will take place November 18th at the world famous Tropicana Atlantic City showroom.